"The community of Moore is, especially fortunate to have been included so often, and so generously, in published events during the years since its place in the world was officially opened to white settlement. "Most of us have witnessed some event during our lives and later read a newspaper account of that same event which caused us to realize that all witnesses viewing the same happening do not agree on what they have seen. Perhaps that’s because we have different definitions for the word “truth”, but more likely, it’s because we watched the event from different positions—and more than that, we were influenced by our individual prejudice and back ground when we committed what we saw to our memory. Unconsciously, even those who believe they are truthful, sometimes tell things the way they wish those things had happened rather than sticking strictly to the truth. 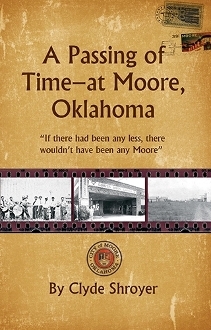 "This book is not about the author, but is based on the author’s memory of a very pleasant childhood, and growing up in Moore." About the Author: Clyde Shroyer was born in Moore, Oklahoma, in June of 1923, and, with the exception of 33 months while in the U.S. Navy during WWII, his home address was always in Moore—until he moved to to the countryside in 1992. He served approximately six years, from 1956 through April of 1961, as a member of the Moore Town Board of Trustees, and four years, from 1962 through April of 1966, as a Moore City Councilman. Clyde passed away in 2015.